As Philip Rylands notes in his article on Palma in the Grove Dictionary of Art, "his vast output represents the impact of central Italian Mannerism but principally of Jacopo Tintoretto on Venetian painting on the generation after Titian, Tintoretto, and Paolo Veronese" (23: 878). Rylands describes him as "a greater artist than his father" and suggests that he was "virtually self-taught, apart from a presumed acquaintance with his father's workshop." He was supported by the Duke of Urbino for four years, who sent him to Rome (until c. 1573-74) for study and where Taddeo and Federico Zuccaro influenced his drawing style. His Roman years also prepared him to appreciate Tintoretto's style upon his return to Venice and to mix a certain amount of naturalism with the prevailing Venetian Mannerism. He began getting major public commissions c. 1578-79 and after Tintoretto's death in 1594, he became the most esteemed artist in Venice which seemed to inspire him to a certain extent keep the glories of Tintoretto's style alive in his own works. The catalogue of his surviving paintings includes over 600 works, including works commissioned by patrons outside of Venice such as the Emperor Rudolph II and King Sigismund III of Poland. Rylands praises him as a "draftsman of great facility" and notes his involvement in the preparation and publication of two books on the art of drawing (Venice 1608 and 1611), the earliest to be published in Italy. As James Byam Shaw put it in his essay on "Drawing in Venice" in The Genius of Venice 1500-1600, ed. Jane Martineau and Charles Hope (NY: Abrams, 1984), Palma's drawings capture the essence of Tintoretto's energy and fluidity as well as the rhythms and grace of Veronese's: "Occasionally Tintoretto may have studied a static living model; but much more often his drawings are of struggling distorted figures in violent action. . . . More detailed studies might have been more useful to himself and to his pupils in carrying out their great works; but above all the tempo of violence had to be maintained. . . . Apart from Tintoretto's own family, and certainly more important than any of them, Palma Giovane . . . in his early figure studies comes near to the Tintorettos in style and character" (p. 244). But Palma, though he sometimes imitated Tintoretto, who only used chalk or charcoal in quick hasty sketches, also used "pen and pale wash to great effect, imitating the method of free sketch practised so brilliantly by Paolo Veronese, who was nearer to him in age. Palma's earlier drawings in this medium have often been mistaken for Paolo's; though in the latter part of his long life, in the early decades of the seventeen century, Palma's handling of the pen became looser, his line more broken, his forms more mannered, and the influence of Paolo is less obvious" (p. 244). Selected Bibliography: Anna Forlani, Mostra di disegni di Jacopo Palma il Giovane (Florence: Uffizi, 1958); S. Mason Rinbaldi, Palma il Giovanni: Opera Completa (Milan, 1984); S. Mason Rinbaldi, Palma il Giovanni 1548-1628: Disegni e dipinti (Milan: Electa, 1990); David Rosand, Palma Giovanni and Venetian Modernism (diss, Ann Arbor, 1967); David Rosand, "The Crisis of the Venetian Renaissance Tradition," L'Arte, xi-xii (1970), 5-63; David Rosand, "Palma Giovanni as Draughtstman," Master Drawings, 8: ii (1970), 148-61. These two drawings are based upon an engraving by Aegidius Sadeler after Jacopo Palma il Giovane (Venice, 1548-1628), Torturer. Red chalk on heavy cream laid paper, c. 1580. A man, is tugging on a rope in his right hand, apparently increasing the tension. In the accompanying drawing, we see that the object of the tightening is St. Sebastian, tied to a tree and bound by the same rope. The drawing itself has been attributed to Annibale Carracci. Image size: 208x138mm. Sold only as a pair: $20,000. These two drawings are based upon an engraving by Aegidius Sadeler after Jacopo Palma il Giovane (Venice, 1548-1628), St. Sebastian. Red chalk on heavy cream laid paper, c. 1580. In this drawing, we see St. Sebastian, bound by the same rope the torturer was using. The drawing itself has been attributed to Annibale Carracci. Image size: 208x132mm. Sold only as a pair: $20,000. Palma tackled the subject of St. Sebastian on a number of occasions. In Palma il Giovanni 1548-1628: Disegni e dipinti, S. Mason Rinbaldi reproduces eight drawings (figures 12a, 13a, 15b, 15c, 16a, 16b, 16c, 21, and 30) from c. 1608-1611. All of these are done in pen and brown ink and wash. An engraving by Aegidius Sadeler (The Illustrated Bartsch, volume 72, part 1, n. 96) shows a Sebastian in a posture almost identical to ours, though rather than grimacing he is looking up, where an angel is flying towards his upraised hand holding a martyr's crown and a palm. Two men are tying him to the tree; the one on the left is clearly the model for the one in our drawing, here pushing against the tree, his head and hands at at the level of the Saint's thigh. The editor's commentary notes that the engraving (see photo below) is "After a drawing by Jacopo Palma formerly in the Woerner collection, sold by Houthakker. The print has been compared to the painting in the Duomo of Castelfranco" (TIB 7201: 096, p. 158). Since Aegidius Sadeler was not born until 1570, I assume that Palma's drawing is earlier than the print and date it tentatively by stylistic comparisons. On the other hand, it is quite possible that our two drawings are studies made after either Palma's drawing or more likely Sadeler's engraving by a later artist (and Annibale Carracci comes to mind because of the fluent use of red chalk); in that case, a date during the 1590s or after becomes likely. These two drawings are based upon an engraving by Aegidius Sadeler after Jacopo Palma il Giovane (Venice, 1548-1628), St. Sebastian. 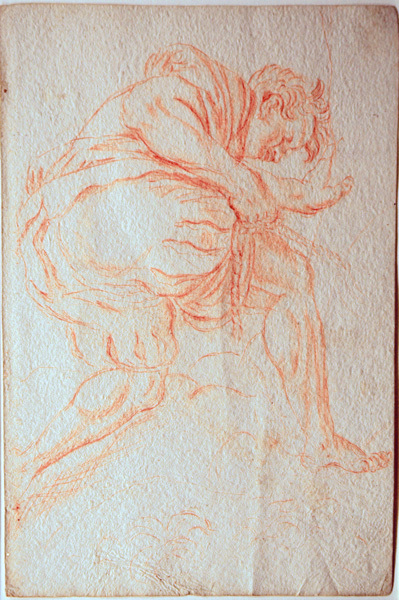 Red chalk on heavy cream laid paper, c. 1580. In this drawing, we see St. Sebastian, grimacing, bound by the same rope the executioner was using. The drawing itself has been attributed to Annibale Carracci. Image size: 208x132mm. Sold only as a pair: $20,000. These two drawings are based upon an engraving by Aegidius Sadeler after Jacopo Palma il Giovane (Venice, 1548-1628), Executioner. 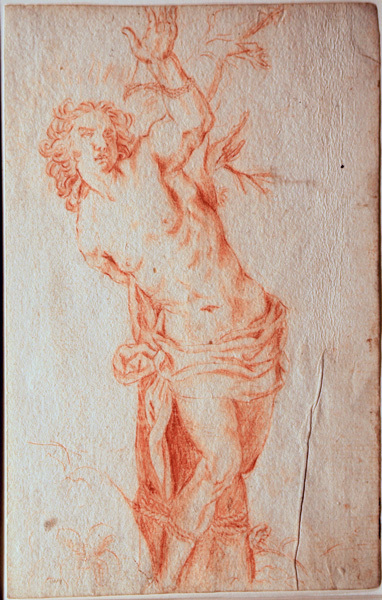 Red chalk on heavy cream laid paper, c. 1580. A man, is tugging on a rope in his right hand, apparently binding someone. 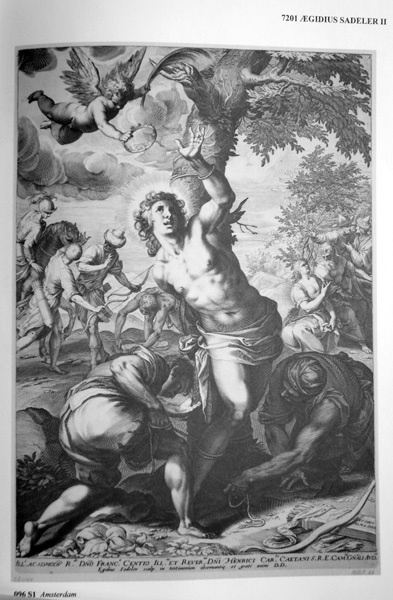 In the accompanying drawing, we see St. Sebastian, tied to a tree and bound by the same rope. The drawing itself has been attributed to Annibale Carracci. Image size: 208x138mm. Sold only as a pair: $20,000.